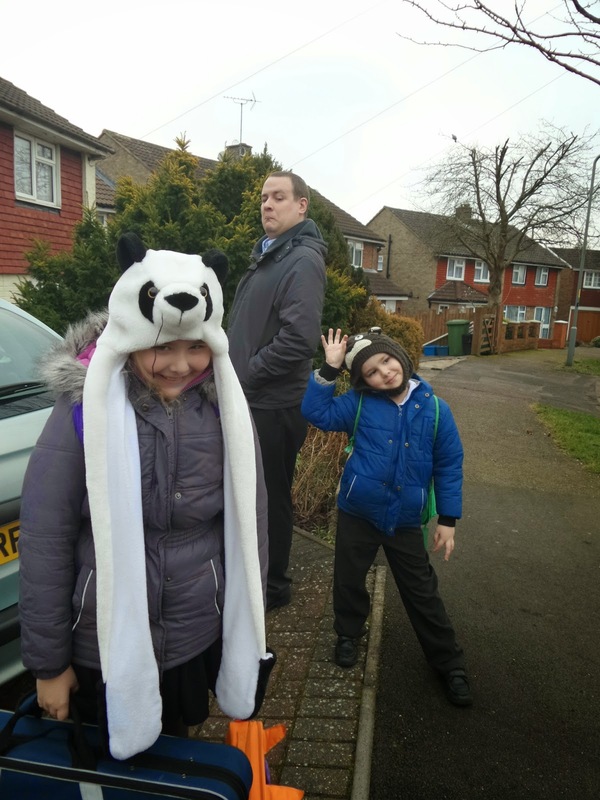 As has now become tradition, we didn't go for a family walk on the Sunday and our Saturday, despite being Valentines Day, was just a normal family day. It did mean however, that the children, Daddy and I had a rather lovely weekend just relaxing and being together. Top Ender and Daddy watched a couple of movies together, Big Boy and I were banished to our bedrooms (we weren't really, it's just "better" this way as then we can all do what we want to do!) and of course Top Ender and I went to Church on Sunday afternoon. Tuesday the Children and I went to the Faith In God activity at the Chapel. 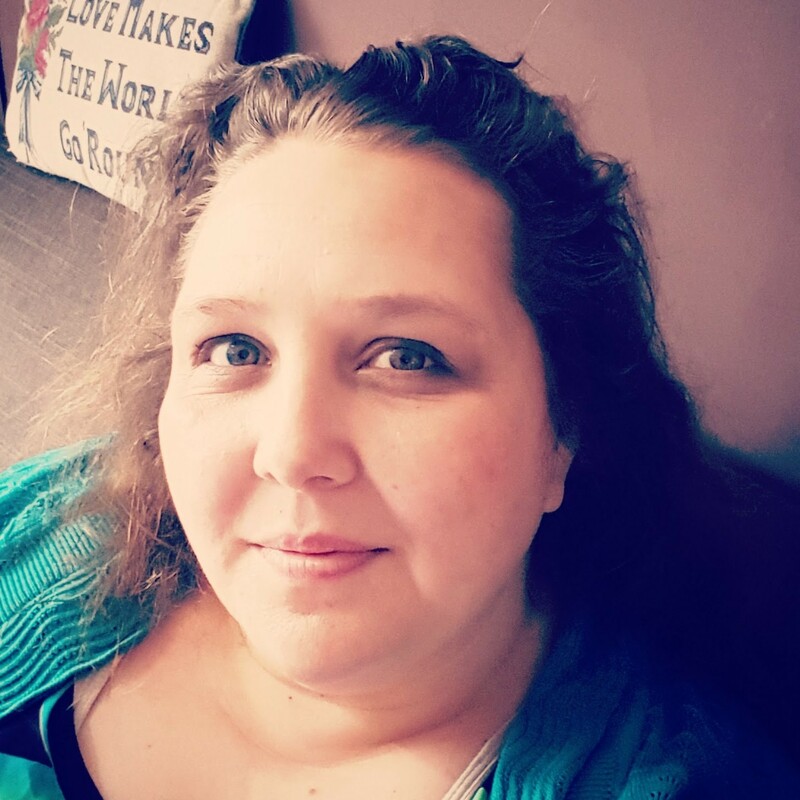 The FIG Leader, is a lovely lady and also happens to be married to our Bishop (and I'm not just saying she is lovely because her Dad sometimes reads this blog! She really happens to be one of the nicest people you could meet). Anyway, when we were chatting the plan had been for the FIG to be a Sports Activity, where the children aged 8-11 (that's the age range for those who go to FIG) could play Table Tennis, Football, Basketball, Hockey and a host of other games), but we realised that Tuesday was also Pancake Day so we decided to combine them... and then we remembered that Chinese New Year was at the end of the week so we decided to throw that in too. In the end the FIG Leader (I'm trying to think of a nickname for her as everyone has a nickname on here!) made pancakes with Top Ender lending a helping hand (Tops was most proud of herself and rightly so as she cooked a tonne of pancakes with the leaders supervision), whilst two of our local Missionaries led sport activities and I took care of the Chinese New Year Crafting, where we made Chinese Dragons and Paper Lanterns. It was great fun, and some of the best colouring and sticking was completed by the boys, who luckily didn't think of crafting as not being as exciting as the sports on offer too. A quick trip on Wednesday morning to the Hospital for an appointment for Big Boy with his Diabetic Team, had me feeling rather buoyant, as BB's HbA1c level has come down yet again and I was congratulated on doing a grand job. 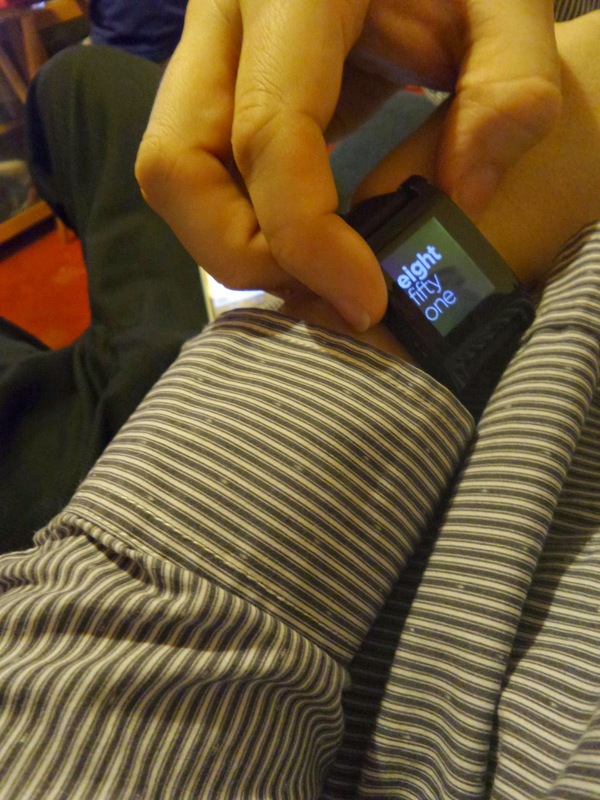 I'm not sure if the Doctor just congratulates everyone every time, or if I'm special but it always makes me feel better about how I'm helping BB manage his Diabetes so bring on the Praise! The rest of the week was a bit miserable outside, so whilst the Children and I were up the Chapel (yes again!) putting up a new Primary Display Board theme, we popped to Starbucks to get us and the Sister Missionaries a Hot Chocolate. 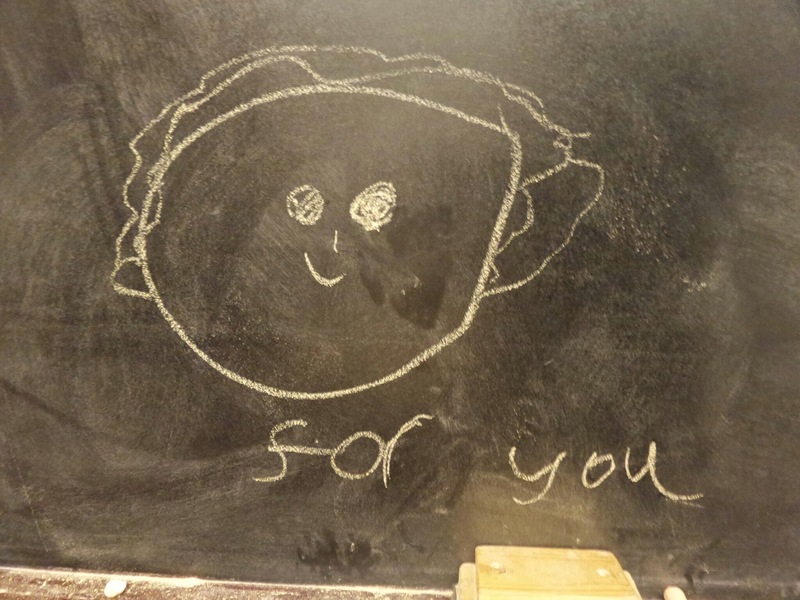 Whilst I was busy, Big Boy decided to do a little drawing for me on one of the Blackboards, he decided it was his contribution to my Welcome to Primary drawing I do each week. If you'd like to see a picture of the Primary Board you can see it on my Instagram Feed. It's not finished yet and be kind, it's my first major photoshop project! To find out if I reasoned away the expense you'll have to come back next week however as technically that happened in the last week of February...! As you might have noticed, the number of books read, things crafted and areas decluttered are missing this week... mainly because this post is already a mile long and I've explained about the crafting and book reading (which doesn't count to my total) already. They shall be back soon however. Big Boy and I were walking home after School the other night, when I stuck my hand in my coat pocket and pulled out a surprise for Big Boy. At Christmas we had each been given a box of Fun Snaps by Father Christmas and mine had magically worked it's way into my coat pocket. We walked the long way home as we knew that we'd be the only ones walking down the hill, as the older children in our road wouldn't have finished School yet and none of them live between the top of the hill and our house. 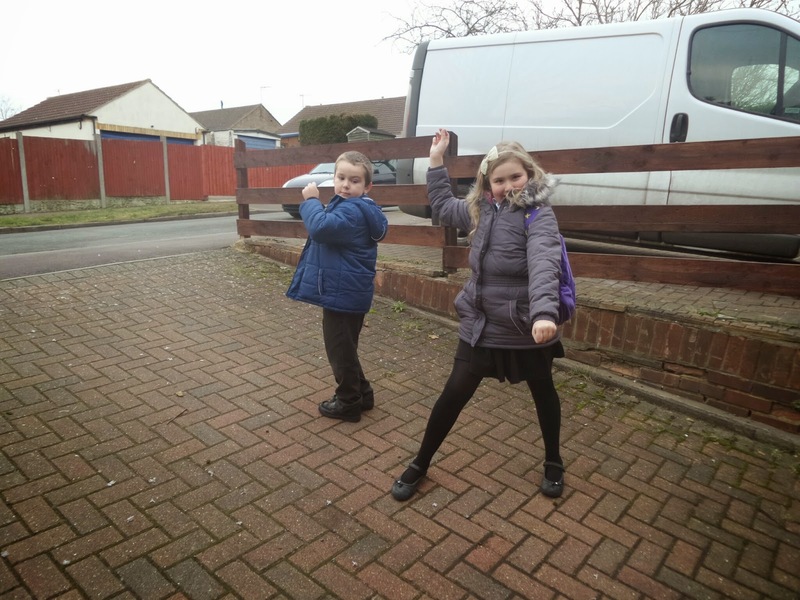 We enjoyed throwing the Fun Snaps as we walked down the hill, at invisible Zombies and other scary monsters that BB said were hiding around corners, behind trees and around the back of cars. 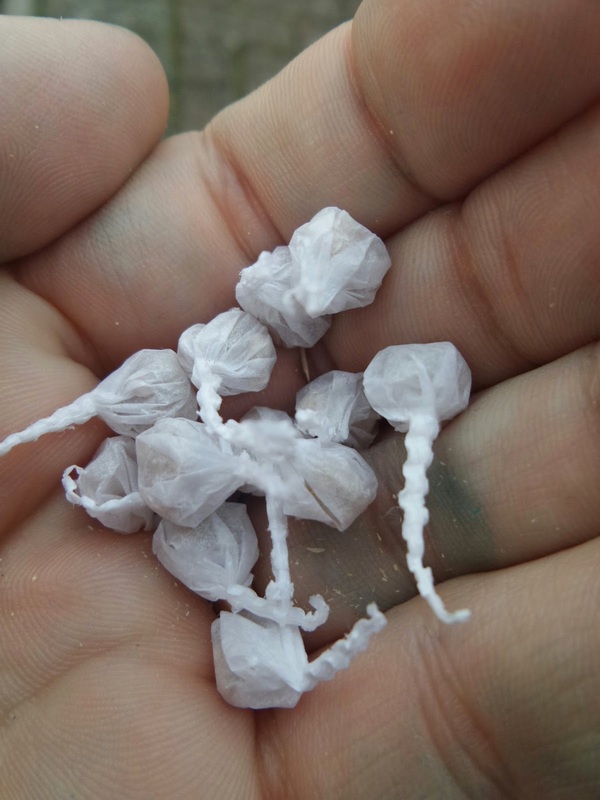 Eventually we only had a few from my packet left and we were back at our house. We had an idea. With the angle we had parked the car, we figured that we could hide behind it, wait for Top Ender to come down the road and then throw them at the ground behind her in order to give her a surprise! So we hid behind the car, sneaking peeks up the road to see if we could see Tops walking down the road. Eventually she arrived and as she stood at the front door, we surprised Top Ender by Big Boy throwing a few at the ground between him and her and me throwing them at the ground in front of her. Sure enough there was a big laugh, and Top Ender ran inside to grab her box of the Fun Snaps and Big Boy ran off to find his. A battle between them ensued, with them both kindly donating a few to me, so that I could join in the fun again. It was one of the most fun after School activities that we'v had... I'm off to the shops to buy some more Fun Snaps for some half term fun. Happy End of Week Everyone! I'm in a jolly good mood at the minute, I think it's because I've been surrounded by lots of lovely people over the last couple of weeks and of course that the Half Term Holidays start tomorrow, along with Mummy Home School! Big Boy had got really upset the other week because he was going to miss School for the five days that he wasn't there and he requested that we sort out Mummy Home School for the half term (it was already in progress!) so that he wouldn't miss School. I do love having children who enjoy going to School! Well, we didn't go for a Sunday walk. I think that it has rather fallen by the wayside as something which we did a couple of times and then forgot about. I am going to try to get everyone going again(and soon!) but for now I might have to accept that family walks are off the menu! I did pick Top Ender up from the designated Brownie Camp drop off point and she'd had a brilliant time. We were warned by Brown Owl that the girls hadn't had much sleep, but Top Ender was eager to go to Church. It was when I realised that she had fallen asleep in Sacrament (in my arms) that I knew she was really tired and we cancelled all our other Sunday activities in favour of Top Ender going to bed! 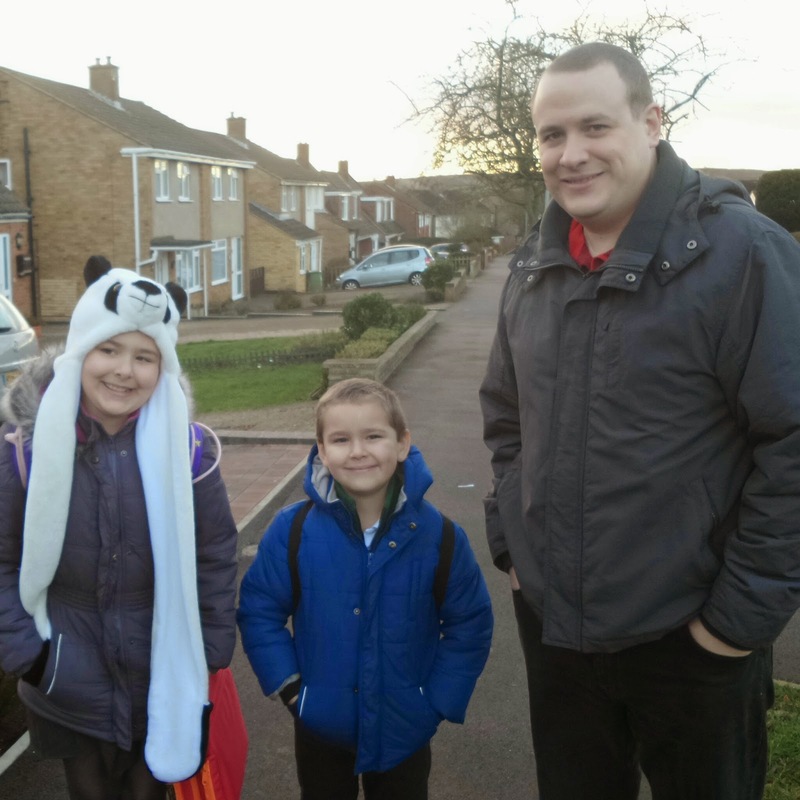 Daddy walked us to School on Monday morning, as he was going in late for one reason or another and so he got to take part in our daily walk to School picture. He thought it most amusing and pretended that he wasn't there. 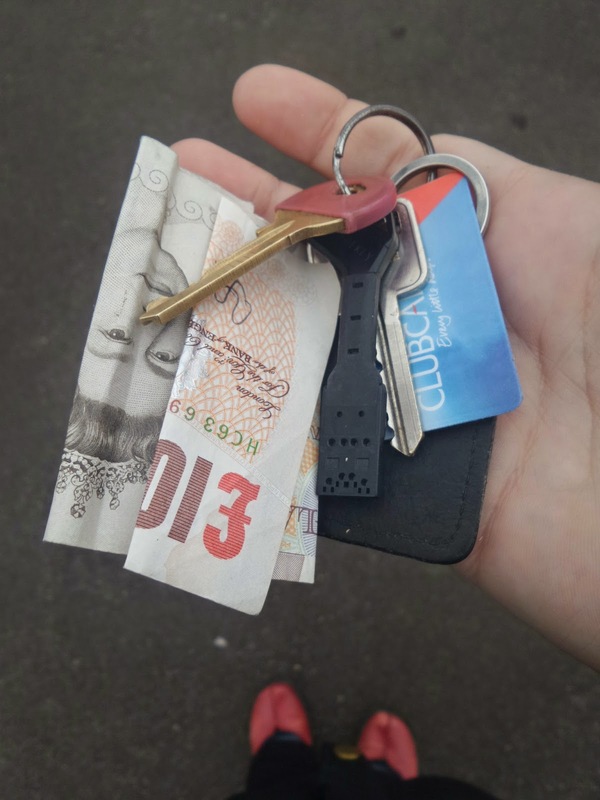 I was talking with a friend on the way home from School a couple of days later and upon sticking my hand in my pocket, to find my keys, I pulled out a £10 note! I was so surprised, but it was a very nice surprise and one which made the day even nicer! I was rather naughty this week and ordered a new dress from House of Fraser (in the sale, don't worry Daddy!). I was rather surprised when it arrived because it was in a box! 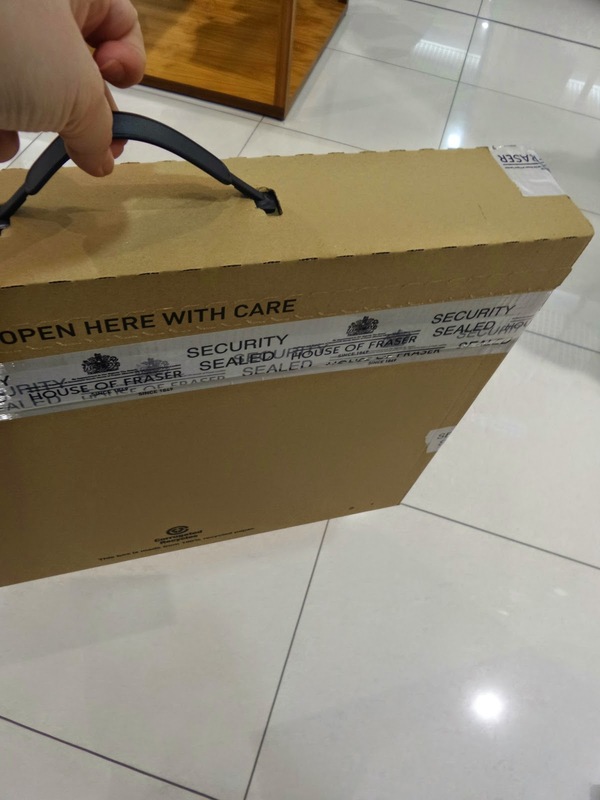 I don't think I've ever ordered a dress that came in a box before. Generally the second week of February has been rather fab. 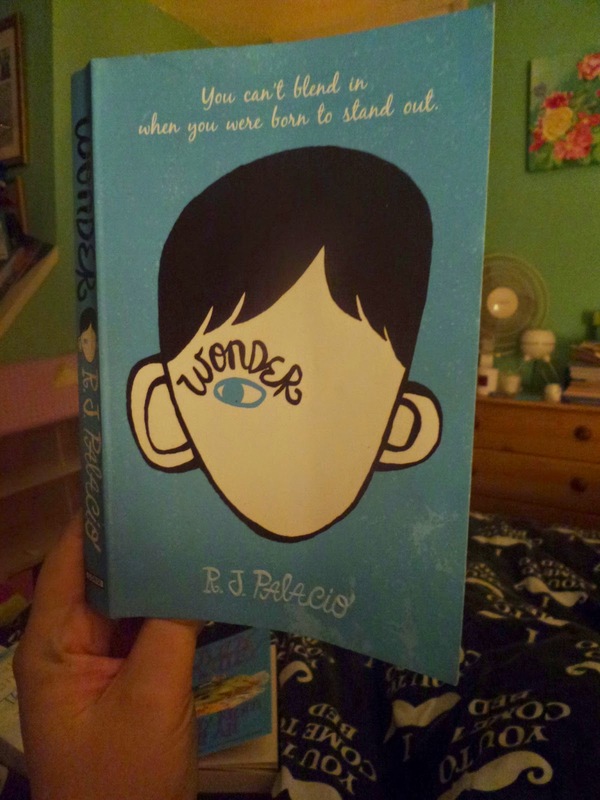 Top Ender has been pestering her teacher to bring home a copy of Wonder for me to read. She's been reading it in School for Guided Reading and discussing it with her class teacher and she felt that I'd love it and so after several weeks of pestering her Teacher finally agreed that she could bring it home for me to read. I started immediately and within two and a half hours I'd finished the whole book. I can not explain how brilliant this book is, but you need to read it if you haven't already. Nothing. Actually, do Milkshakes count? No where. I kinda took a week off from all Housewife type duties. Although I did voluntarily do the dishes without the threat of my husband coming home! So, there's what's happened this week. What's happened in your life this past week? Firstly, Happy Valentines Day to all those who wish to be wished it and to all those who don't... Happy Saturday! Yes, I'm fully aware that I don't need to wait until Valentines Day to show my appreciation to those in my life and if you've read my blog before or know me in real life then you'll know that I don't, but I do like to do something special every once in a while and Valentines Day is a good a day as any! Today I'm ready to spoil my lovely husband and children rotten, as we'll be together and none of us will have to disappear off to Work or School... although I will be going shopping at one point with my Mum and Top Ender, leaving Daddy and Big Boy at home to get up to no good. I love it not because of the chance I have to get flowers and chocolates (please no chocolate this year! I'll take socks as an alternative!) or because I think the shops look lovely covered in hearts and plastered with reminders that Valentines Day is coming up. No, I love it because Valentines Day gives me a chance to let everyone know how much I love them. Even you. And I love you the most, just don't tell all the others okay? I remember learning about how the Greeks had defined love as being different for different people. Phileo for friendship, Eros for romantic partners, Agape for the love of God to mankind and vice versa and of course Storge which is family love. So the children weren't really into making crafts and so I didn't force them too. That's the great thing about crafting, if you're not into it then don't do it! I know that they'll ask for supplies again soon and that's fine by me. Anyone Know How To Stop A Child Growing Up? 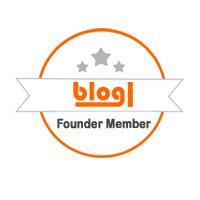 This September Top Ender will go to "Big School". I'm acutely aware of this, as we went to visit the local schools that we had narrowed down our short-list to during the last quarter of last year. We created a list of three schools we thought Top Ender would do well at Academically, Spiritually, Physically and Mentally. The end choice however was down to Top Ender, and she picked the School where the School Librarian seemed the most knowledgeable (I must admit she was pretty fantastic, I almost asked her to adopt me) and the library was the most extensive. She is so her Mother's Daughter. The thing is, I've realised this week that I am not ready for Top Ender to be going to Big School. I know it's a few months off, but this week I realised that my first baby is growing up too fast. For months Top Ender has been requesting a desk in her room, apparently the dining table isn't going to cut it when she goes to Big School and has more homework. We've been putting it off, deciding that in the Summer we'd have better finances and more time and until then we could slowly de-clutter Top Ender's bedroom ready for moving around the furniture to make space. 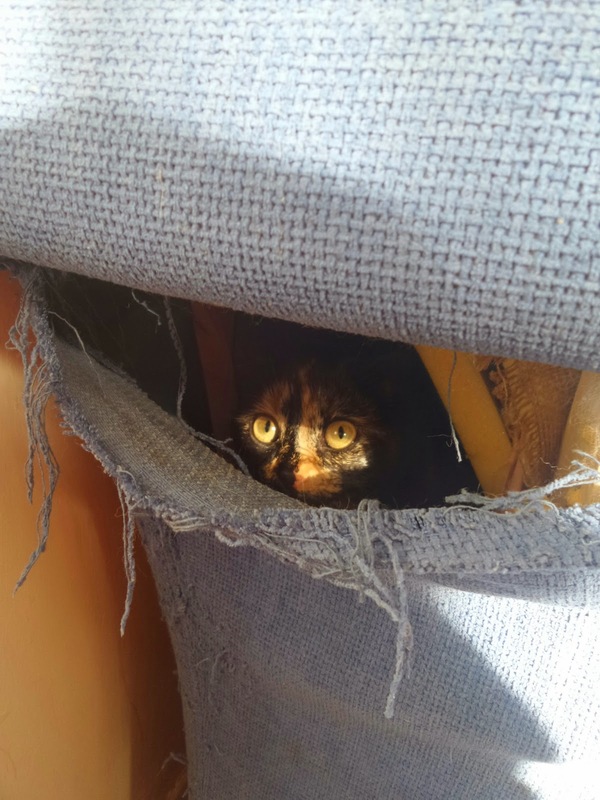 It came to a bit of a head in the last couple of weeks, when Top Ender found the desk she wanted in Ikea and almost refused to move from it until we promised her meatballs. So after a bit of thinking about it, I made a plan where I'd help Top Ender sort out her room and move the desk from my bedroom into her bedroom. It's an almost identical desk, but it's FREE! After a couple of hours work on her room, whilst she was at School, I sat on Top Ender's bed. I'd opened her bedroom window as I was quite warm (probably because I'd been crawling under her bed). And as I looked round her room, I could see a few last trappings of her childhood scattered around and I started getting a little emotional. My firstborn is growing out of the small child she is was, and into the woman she is going to be. It's a good job Top Ender has tissues in her room. Adding to the emotion was being able to hear the Children in Top Ender's and Big Boy's current School on the playground having fun after they had eaten their lunch. 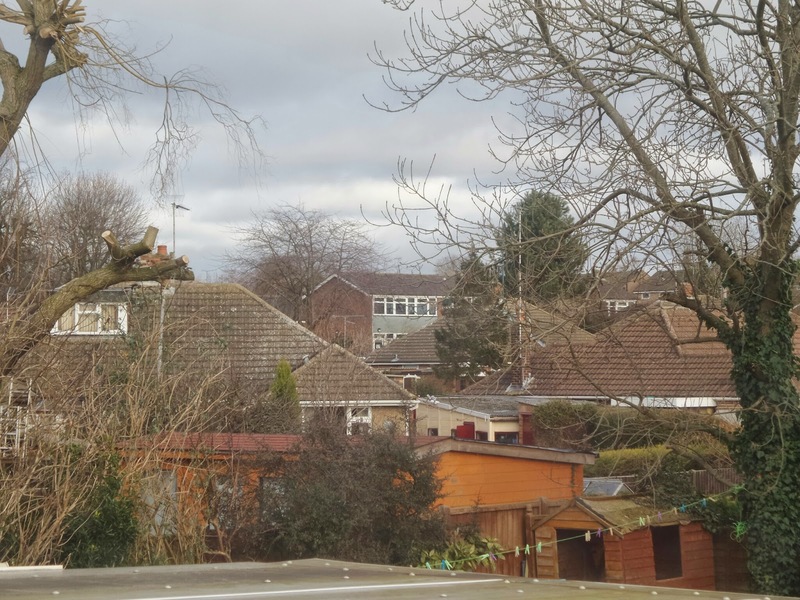 I lay on Top Ender's bed listening to the noise of delighted screams, friendly shouts and the general hubbub that one hears in a School playground. I pretended that I could hear Top Ender and Big Boy and somehow fell asleep. When I awoke, from a very pleasant nap, the children were still playing in the playground but I soon heard the whistle notifying them that it was time to go back to class and so I shut the window and carried on what I was doing in Top Ender's room*. So, does anyone know how to stop Top Ender growing up? *I may or may not have sat in Top Ender's room every day at lunchtime since that day, listening to the children in the playground at lunch. One of the things that my friends and I chat about is, unsurprisingly saving money. A lot of my friends have, like me, chosen to stay at home and despite having joint accounts with our husbands at our banks, we sometimes feel that cooking, cleaning, doing the school run's and whatever else it is that we seem to fill our time with doesn't equally contribute to the level that our husbands do. So we talk about saving money and having a good marriage and strengthening our families and we wonder what we can do and swap ideas and recipes and talk about everything else we can think of that would be of interest to each other as much as it was to ourselves. As is normal at this time of year, we've been talking about Valentines Day and it seems that everyone has got something sorted. 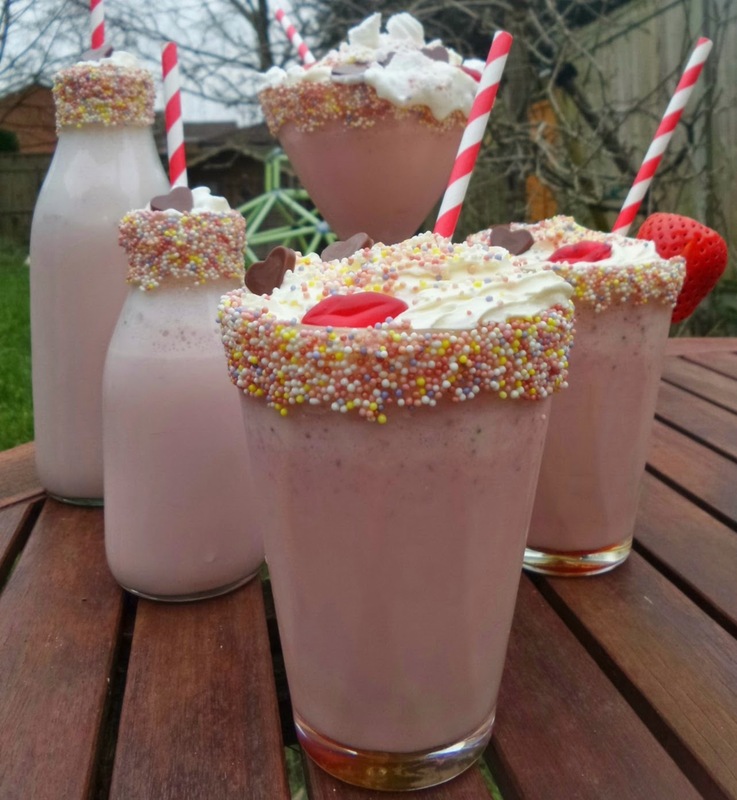 So here is my fail proof recipe that I'm using to make lovely Strawberry Milkshakes for some of those special people in my life... mainly Top Ender, Big Boy and Daddy but I might have some other loved ones out there! 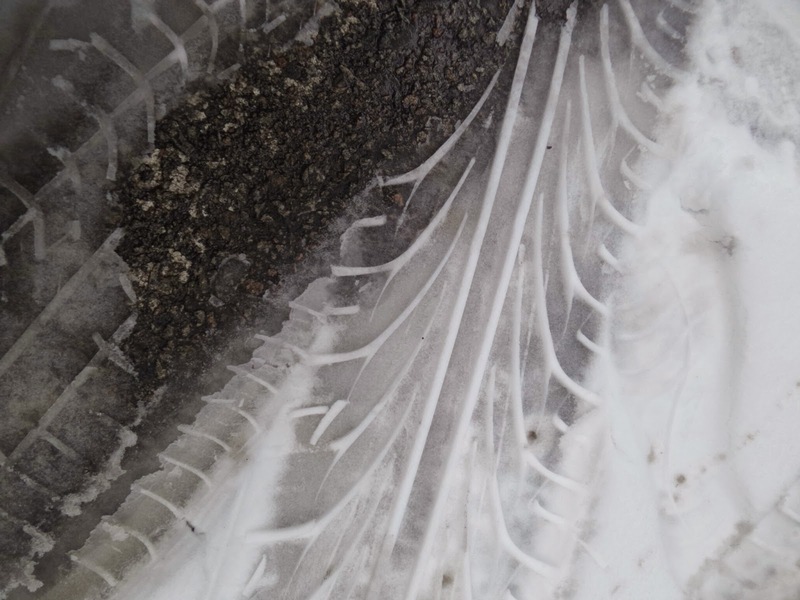 One of the things I do love about February is that it seems such a short month, especially when it snows as it makes every so excited (and by excited what I mean is over react!). I think that because it is exactly four weeks long, if you blink you've missed a quarter of it and it makes it feel like time is moving along really fast. I didn't even realise the first week of February had passed until I made lunch for the children yesterday and realised it was the 7th and we'd better get a move on as Top Ender had her last ever Brownie Camp to get to! Saturday started with us doing some bits a s a family. 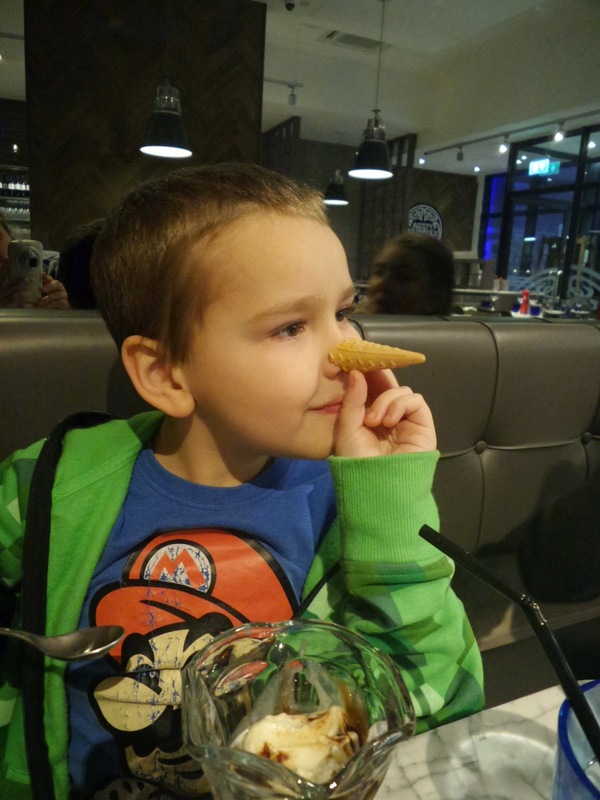 We went to the new Morrisons store that has opened in Milton Keynes, none of us really rated it, and preferred the "new" Sainsbur'ys that is less than half a mile from it and the "old" Morrisons which is about two miles away. Still I suppose that we had to go to find that out and we did find Tiger Paw Bread which I think might be my new favourite thing. We didn't go for a walk last Sunday and I didn't go to Church. You see Big Boy had a birthday party right in the middle of Stake Conference and as I would have the car, Daddy would have to stay at the party to ensure that BB didn't go low etc as he couldn't go anywhere else and he felt a bit uncomfortable as he didn't know the parent or the child who's birthday it was. So we decided that it would make more sense for me to hang around. It was good, BB needs to feel that he is independent and so having a parent not stay at every party he goes to will hopefully help with that! Monday was pretty uneventful, until around 10pm when I noticed it snowing. Top Ender was still awake so I told her to look out the window and she said a quick prayer that the snow would still be there in the morning. Sure enough come Tuesday morning, the snow was still there and we got to walk to School pretending we were on snowy trek. It had of course all melted before the Children were picked up from School that afternoon. Tuesday also saw Daddy going to the hospital in great pain. Luckily he has some brilliant work colleagues who helped him out and meant I didn't have to worry about cancelling my meeting to drive up to Birmingham to bring him home. After some lovely pain killers from a kindly Doctor and a good nights sleep Daddy was able to face a couple more days at work. Wednesday morning had Big boy reading both to Top Ender and me, which was so sweet. 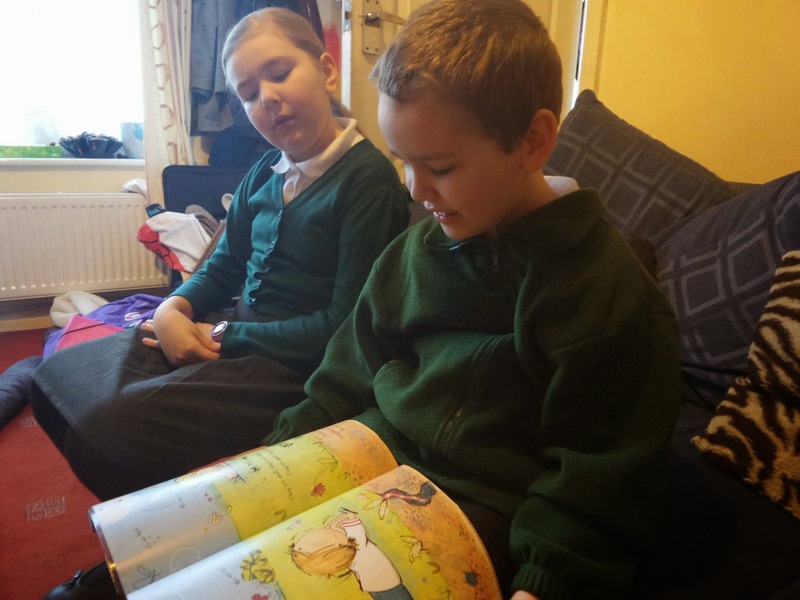 I also had a chat with my Sister, put a load of washing on, cleaned up the living room, gave the children a cooked breakfast, helped them get washed and dressed and had a chat with Top Ender about the book she was reading and how she found it useful to draw comparisons with history to understand the book and how she thinks it will turn out. And that was all before the Morning School Run. 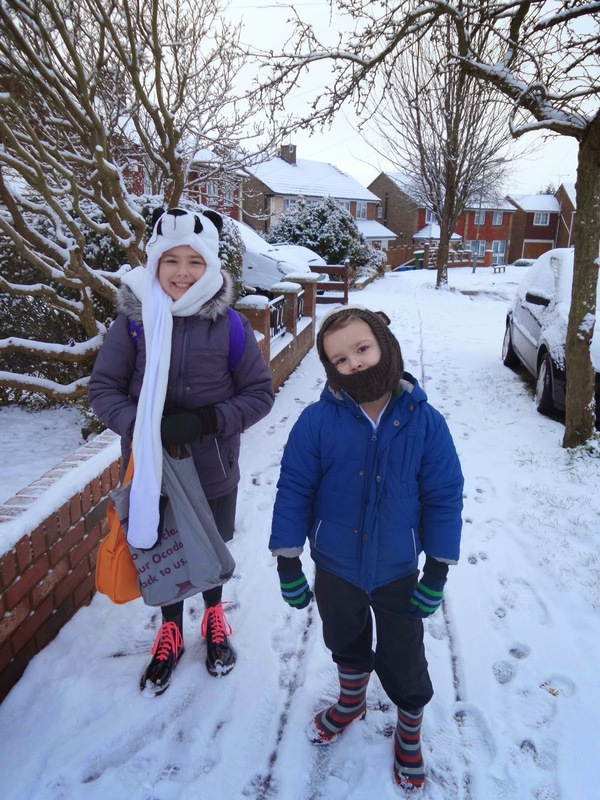 I'm thinking that Parents are blessed with one amazing morning per term, because we're not going to be able to repeat that morning for quite a while! In the evening as part of our Family Home Evening we went for a walk and watched the sunset between the trees. 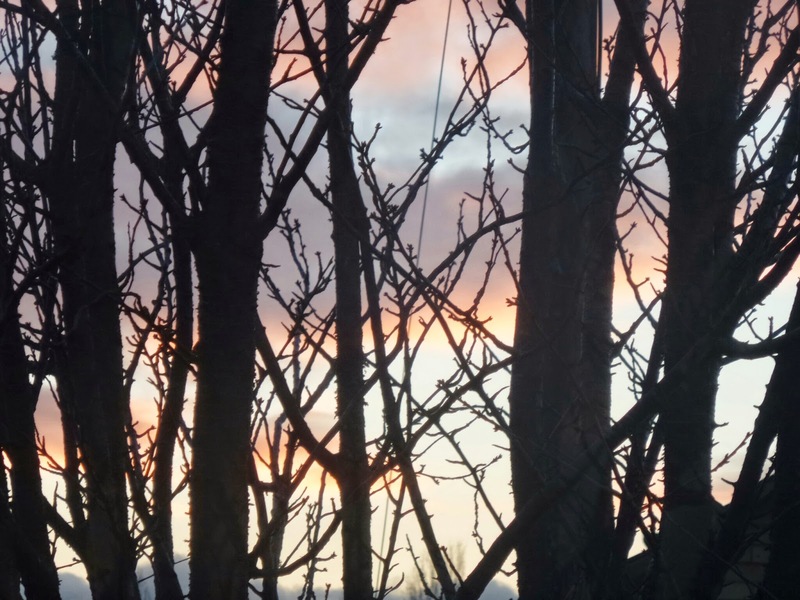 The sky was an amazing colour and I think with the blackness of the trees it really made a striking photograph. The Children and I chatted about taking on the name of Jesus Christ, and how that means we should behave and how people expect us to behave because of this. We also spoke at length about how being known as Top Ender's Brother, or Big Boy's Sister or even as Pippa D's children affected how others saw us and what they expected from us. My Children can be pretty insightful when they want to be! 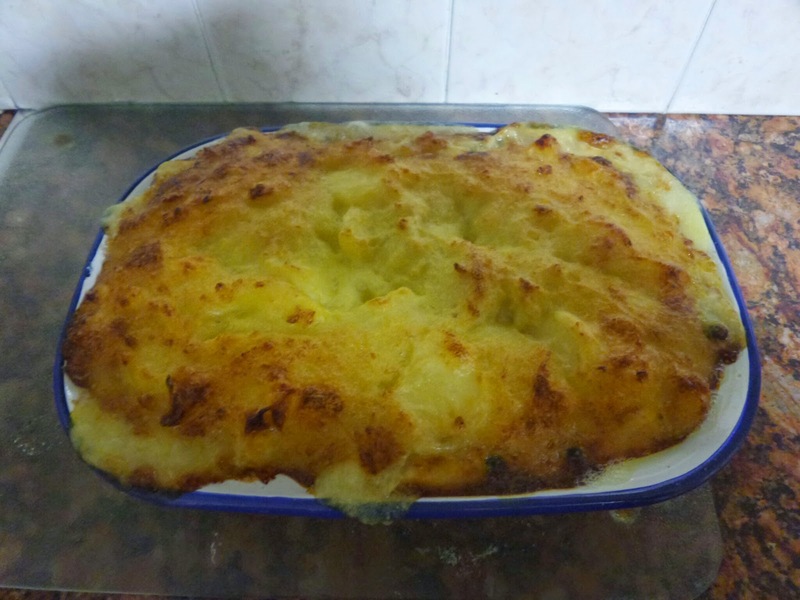 We had the best Fish Pie again for dinner this week, it's such a simple meal to make, but the children and I love it and I'm adding a few different touches thanks to a question I asked on my personal Facebook profile a few weeks back. My cousin who is a chef suggested that when I first cooked the fish in milk that I actually cook it in the white sauce, so I tried that this week. It was FAB! It certainly pays to have a chef in the family and if anyone is near St Neots, pop into the Ye Olde Sun and have a meal he's prepared! Just behave well, or you'll get me banned and I've not made it across there yet! 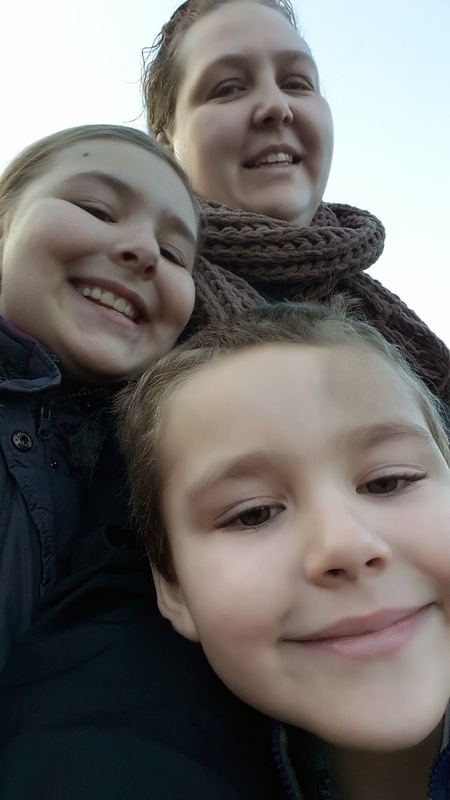 Friday had the children and I taking selfies on the way to School and causing one of our Neighbours to crack up laughing at us. As she's only recently joined Facebook, I give it a few months before she's taking Selfies and then I can return the favour and giggle at her standing in the street trying to stretch her arms to keep everyone in shot! Tops and I also performed a really, really, really important task on Friday night. We were entrusted with the Chocolate Run (Daddy is still pretty much unable to move without pain, so we took on his normal job!). Top Ender thought this was the best job ever although she wasn't very good at picking chocolate and kept trying to buy things we didn't need... like bunches of flowers and packets of vegetable seeds! I read The Affair, which is one half of a book but I am having it as two books! I really couldn't get into the story to start with, but as I realised I was reaching the end of the story I started to miss the Characters that had been created and did have a couple of moments where I was crying real tears over the lives that had been created. 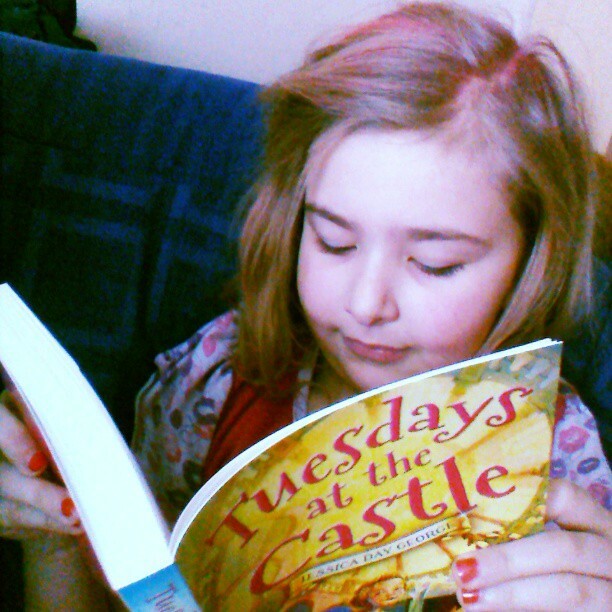 I have three other books on the go at the moment (in different rooms! ), so didn't feel bad about only finishing two of the five this week. I'll write about the others when I've finished them! I read a few cook books too, but I don't count them in my total... mainly because if I did I'd be finished before the end of the week as I'm always reading cook books for new ideas and as a sort of way to pass the time! Not a lot actually. We have had our new Bostik Box arrive and I'm stupidly excited about the mini glue dots, but I didn't finish any other projects that I can share with you yet. I'm actually not sure what I did at all to be honest! The Children however haven't stopped making things this week having made a few more bookmarks, some rather lovely pictures (even the one that BB described as 100 ways to die in Computer Games) and Top Ender has been making a mountain of things with Loom bands, as they are now really cheap because nobody else is making anything with them any more! The bathroom. All the plastic bags of things that needed to go elsewhere this week were put into the bath, because that way they were out of the way and nearish the front door. That also meant that every time I wanted a bath I had to pick them all out and put them in the hall and then dry the bath to put them back. Enough was enough this week and in between helping out a lovely friend of mine (seriously he is amazing fun and I'm glad to be able to help him out) with a few lifts I ran the bags to various places that accepted donations. So that's about it. As normal there was more, which if you follow me on Facebook, Twitter or Instagram you may have heard about! If you want to hear more then just ask in the comments, I'm mostly an open book! My Sister and I love what we call "Old Music", for us it was the music that our parents played and they grew up listening to and for young chickens (my sister and I!) I think we know a fair amount of songs and different groups. 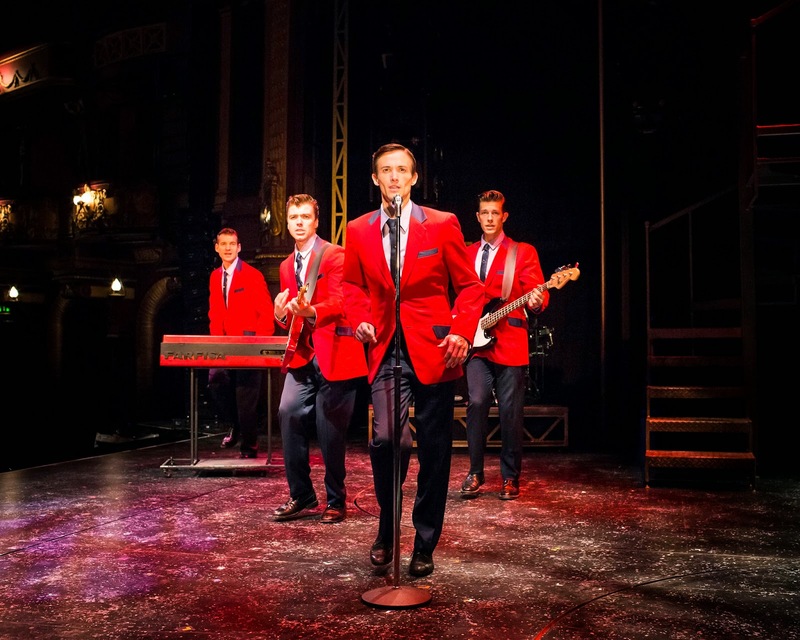 So last night, we decided to head off to the Theatre together to watch Jersey Boys, which is the story of Frankie Valli and The Four Seasons... one of the groups we were brought up on. I've seen the show before, but my Sister hadn't and so sitting together in the dark singing along with her to the songs we both knew and were used to singing together in the back of the car or whilst lounging on the sofa as Children was magic. A few weeks back, a new drink was sent to Top Ender, Big Boy and I to try out. I was intrigued about the idea as the drinks are a range of essential vitamin-enriched drinks designed especially for Children and with a sports cap and a sensible size of 330ml, they are the good size to add to a lunchbox or as is the case with my two, perfect for stowing in my handbag for when we are out and about and a bottle of "plain" water just won't do. As you may guess looking at the bottles, they are indeed a blend of fruit flavours (Mango, Apple and Orange) with water and as an added bonus, they have no added sugar. The thing that sold me on the drinks wasn't that they are under 10 calories a bottle, but the amount of carbs in each bottle (the carb count is important for us as it's how we calculate BB's insulin) is around 0.3g. The children and I conducted a very scientific taste test, where to the sound of Salt-N-Pepa singing Push It we drank a little of each flavour and had a dance (I so wish I'd thought to video it, especially because I still remember the Salt-N-Pepa Dance and the children spent most of the time wetting themselves. Wait until they see my Spice Girls Wannabe performance!). The results were that both children LOVED the Mango flavour. Neither of them liked the Apple, but then they aren't Apple fans generally and both liked the Orange flavour. I liked all of them, but it was the Apple one that I liked most seeing as how that was what I was left with. The children think I should also point out that the drinks don't in any way enhance my ability to dance. 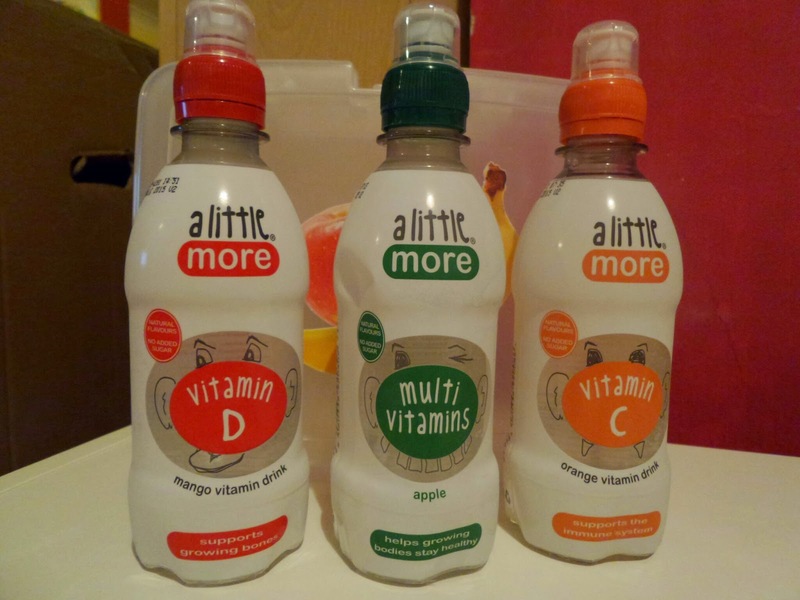 The A Little More drinks are available from Tesco, ASDA and Ocado stores but we had them sent to us to try for the purpose of this review. Simple Snowman Cakes And A Call For Snowy Craft Ideas! 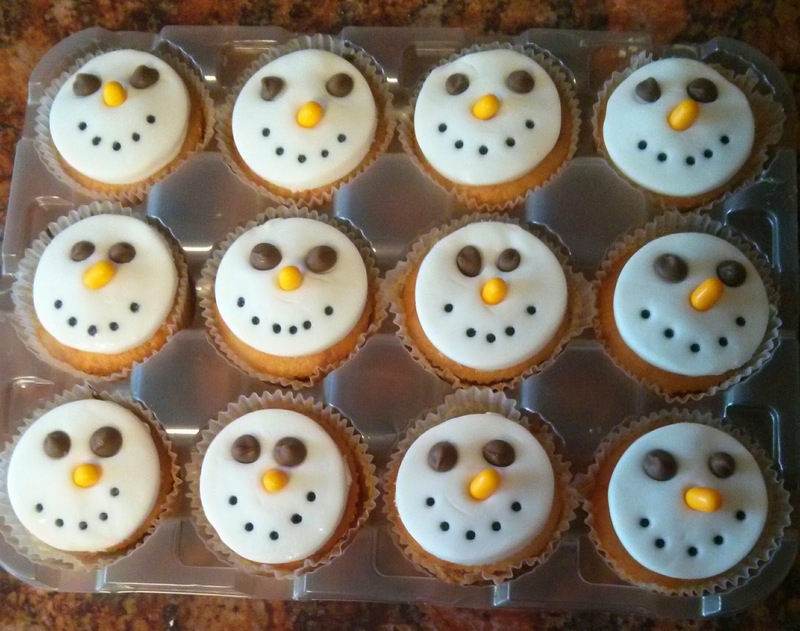 Last year, I baked some really simple Snowmen Cakes for my Primary class at Church. They were so simple and yet so impressive, that I thought it might be fun to make them again this year when we got some snow. 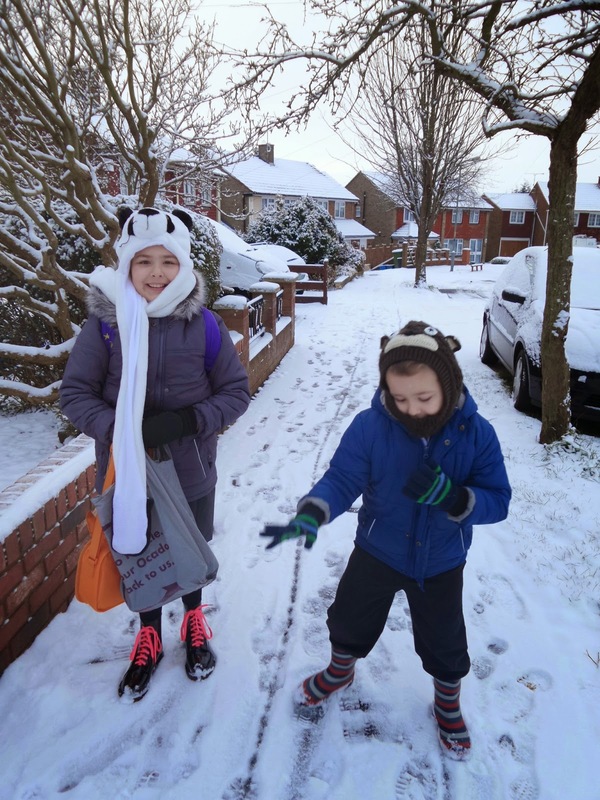 It seemed to me over the last few weeks that Milton Keynes was the only place in the UK with no snow and as my children were getting restless (okay I was) I'm so pleased that now we have the snow! 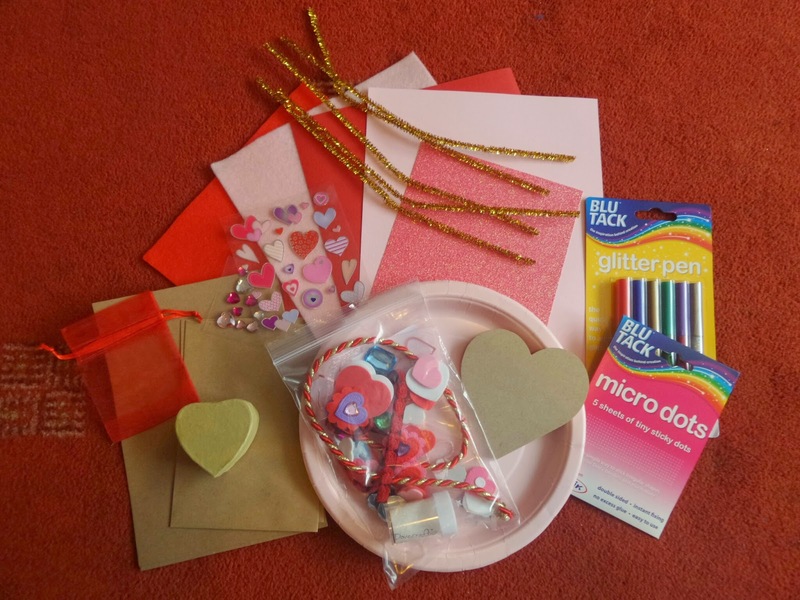 I've been lucky enough, to be asked back to being a Bostik Blogger this year and when our first box arrived I had planned to make some Chinese New Year Goodies with the children. Luckily Bostik had thought along the same lines and had sent plenty of gold and red goodies across. This is good because red represents good fortune and gold/yellow is the centre, and an important colour for a whole host of reasons. So we were also given some glue dots (I love glue dots) and foam pads to play with. What would we make? Well I asked the children and after a discussion of how it was going to be the year of the Sheep, the same as when Top Ender and I were born we knew that we had to make a sheep and a Dragon! Big Boy started on the Sheep whilst Top Ender started on the Dragon. 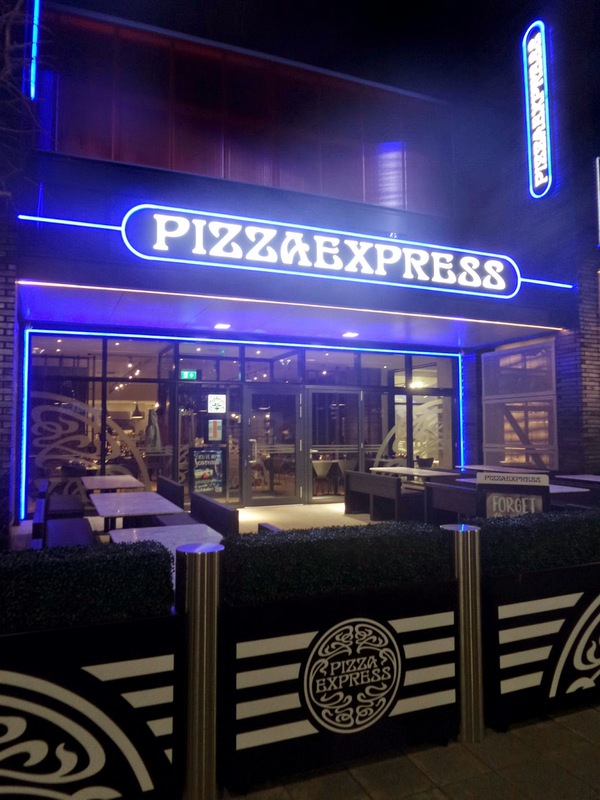 When the Children, Daddy and I discussed where we should go to dinner together as the treat that we'd been saving up for we knew we wanted to go to one of the new Restaurants that has opened up next to the MK Dons stadium, or as we call it The Queens Cinema. In the end we decided as a family on Pizza Express because they do a good gluten free Pizza and Chocolate Brownie which means that Daddy would be able to enjoy a full meal too. The meal out was fantastic fun, the food was yummy and filling and we all had a good giggle. The best part however was when it was time to pay the bill. The children took great delight in pulling out the money we'd collected and handing over the right amount of cash (and tip) to the chap who'd served us and kept us entertained all night. I think that he was more surprised to see the children paying for our meal than he was that the children remembered to give him a tip.